TUI Cruises upcoming cruise ship Mein Schiff has moved to its final phase of construction at the newly owned Meyer Turku shipyard in Finland. “1,300 of our employees are currently working on the ship. With 65 percent of completion, we are right on schedule, “said Dr. Jan Meyer, CEO of Meyer shipyard Turku. 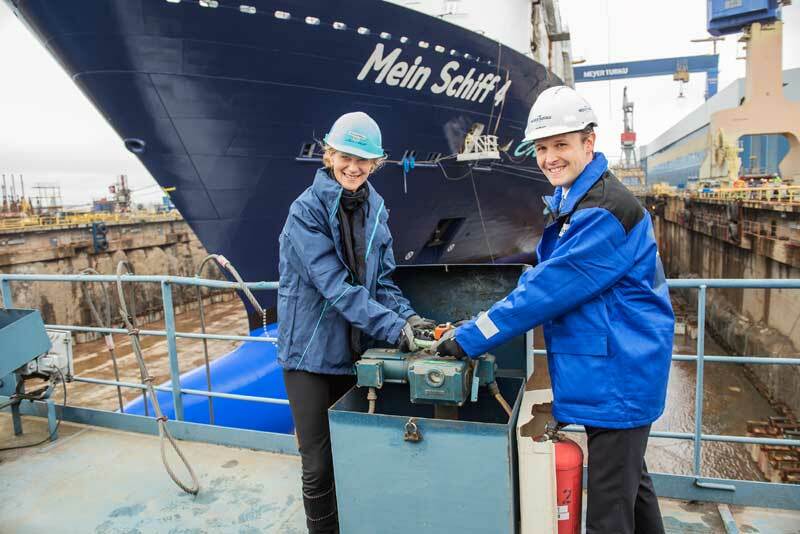 For the first time in the ships construction water raised up to touch the keel of Mein Schiff 4 for the very first time. There was also a traditional ceremony to celebrate the milestone. The new CEO of TUI Cruises since October 1st, Wybcke Meier and the new CFO of the Meyer Turku shipyard, Jan Meyer attended the event which is also known as a “float out”. The dock where Mein Schiff 4 was being constructed was filled with 300 million liters of water which was activated by the two executives turning the water wheel. The 99,500 ton vessel then moved to another part of the shipyard to begin it;s final stages of construction. In it;s final stages all the interior and outdoor spaces will start to be fitted out to make the ship a floating hotel. Mein Schiff 4 maiden voyage will begin on the 6th June 2015 from Kiel and will call at Tallinn, St. Petersburg, Helsinki and Stockholm before heading back to Kiel. Sister ship Mein Schiff 3 has recently entered service and the German cruise line also has another 4 ships on order within the same class.